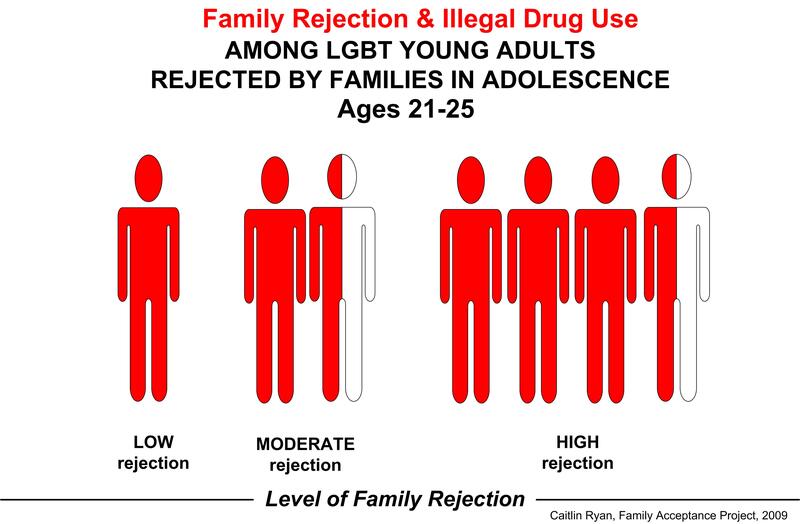 Studies over several decades on lesbian, gay and bisexual (LGB) adolescents and adults, and more recently, on transgender and/or queer (TQ) youth and adults, show higher rates of substance use and abuse compared with the general population – and for adolescents, earlier initiation of use compared with heterosexual peers. 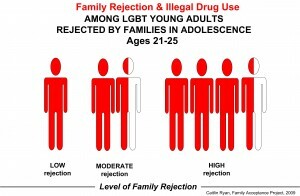 LGBTQ youth, like adolescents, in general, use alcohol and other drugs to experiment, to fit in with peers, and to manage depression and anxiety. However, for LGBT youth, social stigma is an added stressor, often experienced through school harassment and victimization, family and peer rejection and discrimination in social institutions. Minority stress – higher levels of stress related to negative social pressure and rejection – is attributed to higher rates of substance use and abuse among LGBTQ youth and adults, along with other health risks. 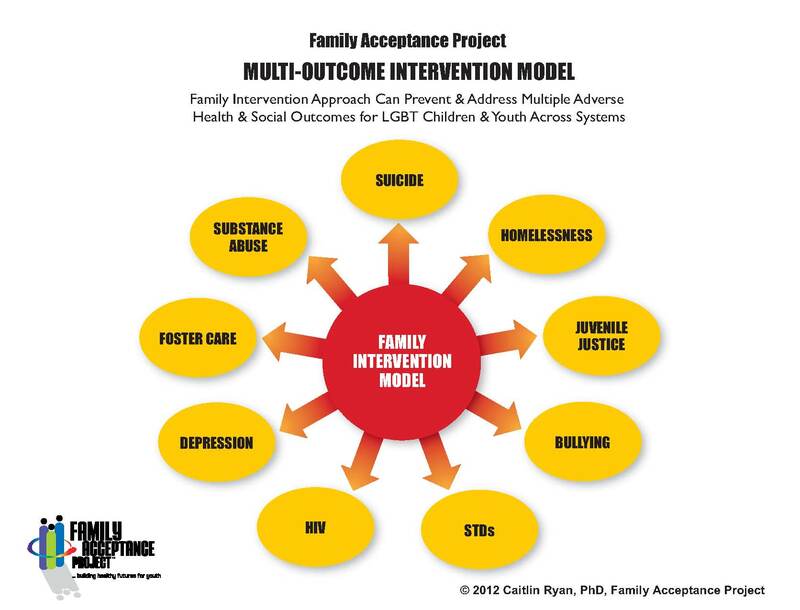 Although connections to family have been shown to be protective against major health risk behaviors, including substance use, for adolescents overall, little attention had focused on the role of families in contributing to risk and well-being for LGBTQ youth. With little known about their families, services for LGBTQ youth over several decades focused on supporting LGBTQ adolescents either individually or through peer support, but not in the context of their families. Concerned about this critical gap in research and practice, as adolescents increasingly were coming out at younger ages compared with LGBTQ adults from earlier generations, we started the Family Acceptance Project in 2002 as the first research, education, intervention and policy project to: 1) strengthen and help ethnically and religiously diverse families to support their LGBTQ children; 2) prevent health risks, including substance abuse and promote well-being for LGBTQ children and adolescents; 3) help LGBTQ youth stay in their homes to prevent homelessness and placement in custodial care; and 4) develop a new evidence-based, family intervention model of wellness, prevention, and care to promote well-being in the context of families, cultures and faith traditions. Through mixed methods research that included comprehensive interviews with LGBTQ youth and families that were accepting ambivalent and rejecting of their LGBTQ children from rural, urban and suburban communities, we identified more than 100 specific behaviors that families used to express acceptance and rejection of their LGBTQ children. These include behaviors such as preventing LGBTQ youth from learning about their LGBT identity versus connecting them with a positive role model to show them options for the future. – compared with peers from families that reported no or low levels of family rejection. In addition, although perceptions of family reactions were overwhelmingly rejecting prior to our research, we found that family reactions to their LGBT children were much more varied and hopeful than had been previously assumed, and that rejecting families could learn to support their LGBTQ children when information was presented in ways that were culturally relevant for them. 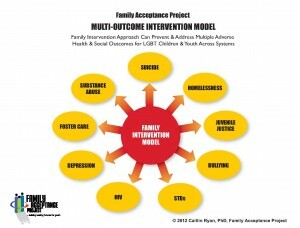 Working with diverse families with LGBT children – including socially and religiously conservative families – we developed family intervention strategies to engage and help families to decrease rejecting behaviors that contribute to illegal drug use and other health risks and to help them increase supportive behaviors that help protect against risk and promote well-being. A cornerstone of our work has been meeting families where they are, framing our research and counseling approaches in the context of cultural and religious values, and helping them understand that their behaviors have consequences – not just for their LGBTQ child, but also for their family. 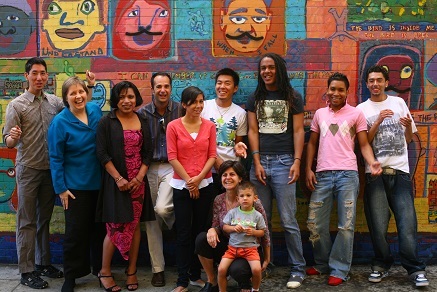 Since 2007, we have been developing research-based multilingual family education booklets, including faith-based versions, that are “Best Practice” resources for suicide prevention; award-winning family education and training films that give LGBTQ youth and families hope and show the journey of families from struggle to support of their LGBTQ children; a risk assessment screener to identify substance abuse problems, suicidality and other health problems related to specific family rejecting behaviors; and a framework for preventing multiple negative health outcomes through family intervention and support. Engaging and helping diverse families to support their LGBTQ children is an underused, low cost, culturally congruent resource that agencies, institutions and communities must begin to provide to build healthy futures for our LGBTQ children. We also partnered with Human Rights Campaign to publish an issue brief on the unique challenges faced by LGBTQ teens that contribute to their heightened rates of substance use.